Card of the Day ~Move~ This is a message about moving-most likely, it means that you’ll soon be moving to a new home. You’ve been considering the possibility, and this is validation of that idea. The angels will help you locate a wonderful new home and assist with the details of leaving your present location. Give any worries about this issue to Heaven; and have faith that the finances, family concerns, and other issues will be taken care of. This is also a message about moving your body more. 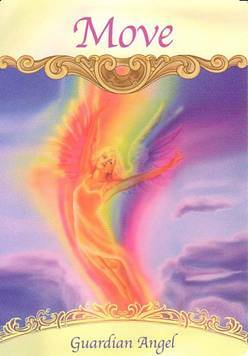 The angels ask you to create movement in your life through physical motion. You can do this by swaying or dancing to music, exercising, hiking outdoors, playing with our children, and so on. All this movement helps you make a fresh start. It ushers in wonderful new people, experiences, and opportunities, so give any worries that you may have about making these changes to God and your guardian angels. I pray you have a fantastic day. I love you all!